Regardless of these issues, there is no CHANCE that I will miss the most exciting day of the week…What I Ate Wednesday!! Those of you in the know are aware that this is just about the most fun day of the week. It’s all under the careful direction of Jenn over at Peas & Crayons. So when you’re finished here, be sure to visit over at P&C to see what all the shouting is about! Here we go!! Now, again, I realize, we’re supposed to be talking about sensible snacking. Well, again, have no documented snacking. The trouble might be that I’ve been doing under the table snacking…undocumented means it didn’t happened. It’s been a bad week that way. I’ve got some good food shots…snacks or not! After Ralph’s art class Monday morning, we went out for breakfast. I tried to be good and I feel that I was with a wonderful big bowl of hot oatmeal. 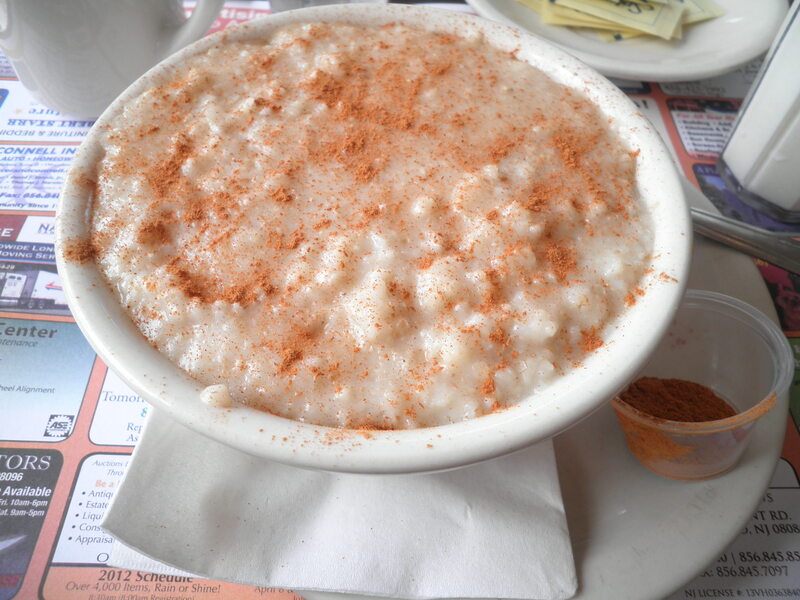 This particular restaurant makes probably the best oatmeal in the area. Topped with cinnamon…Yum! Here was my first use of the “deconstructed” black bean burgers. 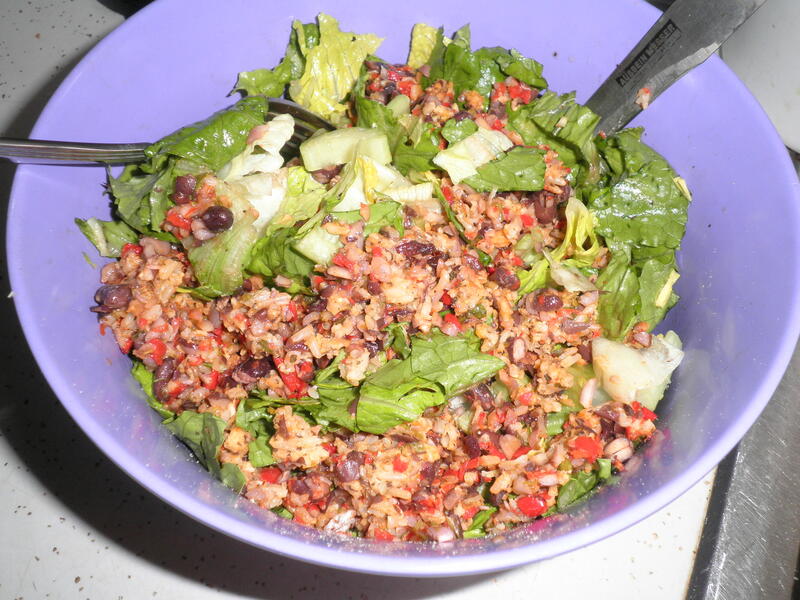 A simple salad with the “burger” mixed in. The best feature was the dressing I tried. Mixed my 1Tbsp of olive oil, 1 Tbsp of Honey and 1 and 1/2 Tbsp of red wine vinegar. I added the juice of 1 lime, then a little dash of Mrs. Dash Fiesta Lime Seasoning. It was SO good. My new favorite! Ok, here’s a snack! 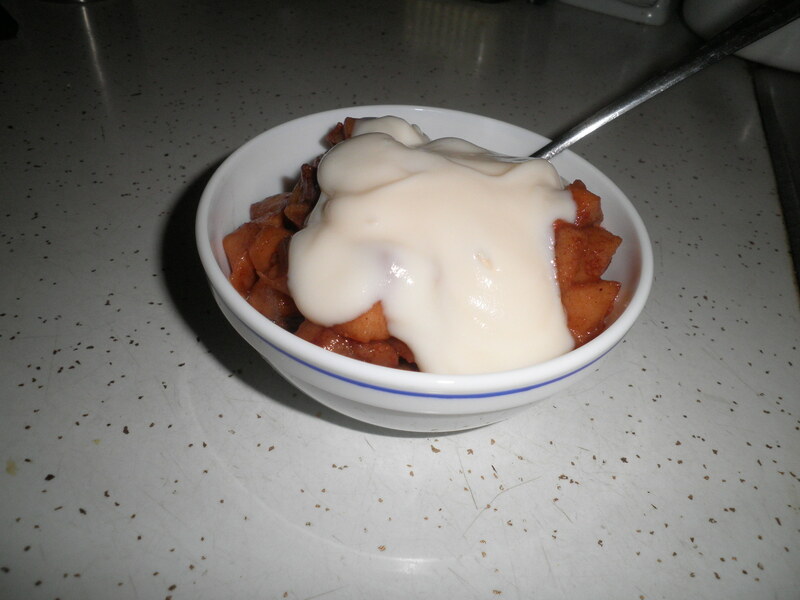 A nice helping of the crock pot apples I made over the weekend smothered in fat free vanilla yogurt. Very tasty! Ralph had a doctor’s appointment so afterwards, we headed to breakfast. 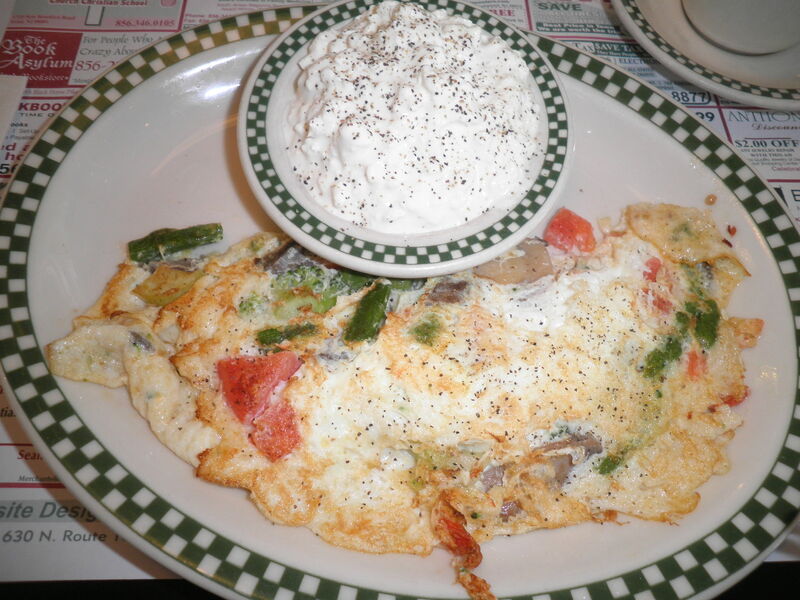 This is a special omelette with egg whites, broccoli, asparagus, onions and tomatoes accompanied by cottage cheese. Very tasty and a good choice on Weight Watchers. So that’s it for WIAW for me! I normally do my WIAW post on Tuesday and set things up to post on Wednesday. However, with my WordPress issues…I just realized the way I’m posting gives me no option for scheduling my post. So my choice is either post it now or have to do all of this early Wednesday morning. So those of you who follow me with find yourselves getting a second post on Tuesday. Don’t worry…there is no extra charge for this. It’s a Gift!! Be sure to head on over to Peas & Crayons. Lust after some delicious food, leave some comments. Everyone will thank you for it! This entry was posted in Uncategorized and tagged WIAW. Bookmark the permalink. Thanks for the bonus gift Fran 😉 I think your deconstructed burger salad looks tasty! And I still love the broken cookie concept–it’s genius! I’m hoping to get this figured out, Stacie. It’s making me a little crazy! a second post in this day is just fine with me, fran! watch out – we could get used to a morning and an evening visit. your deconstructed burger looks so good that i think i would make them on purpose that way – who needs a burger shape?! i do hope you can get wordpress sorted out…i have contacted their support team before and they were really helpful…fingers crossed for you!! Thanks, Cathy! I’ve never had much help from them. They seem to take Forever to get back to me and most times they haven’t ever gotten back to me. My friend, Kristen is trying to help me. But believe me, I appreciate the crossed fingers! Gosh, all of your food looks awesome! Woot woot to you and keeping it healthy, balanced, and fun! I love cookies and yogurt! And I will definitely have to try that black bean burger mix! Cara, once I have perfected the burger, I think everyone will enjoy it. Soon, I promise! Have a great day! Oh my,that oatmeal… These apples… That cookie! Everything looks so good! Hi Kat! The apples are one of my favorite treats and so easy, done in the crock pot! WordPress is still being a thorn in my side…help! Actually, being frugal lately, I order oatmeal when we go out. I specifically asked Ralph to take me to this restaurant because I think they have the Best!! Great, Jennifer! It’s so good, I think you’ll enjoy it! Let me know what you think! Marie, I intended to do that, but I was so frazzled by the darned WordPress thing that I forgot What the Heck I wanted to say! Thanks for saying it for me! Your big salads always look fantastic!! Thanks, Mass!! They are my Favorite! 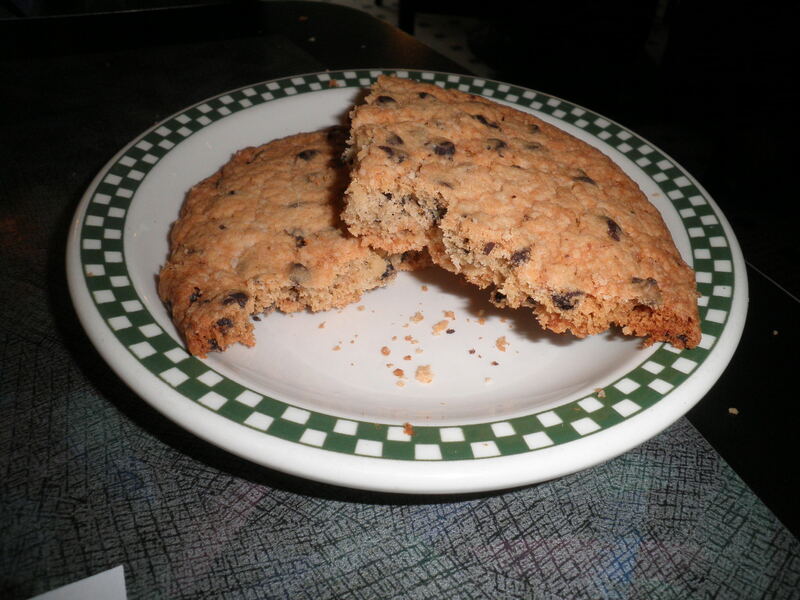 Ohhh man that cookie looks delicious (even if it’s no oatmeal raisin cookie…the one kind I will never resist ;D ). Oh, Allie, oatmeal raisin are my favorite too! The cookie wasn’t that good…too sweet, but it made for a good photo opp!! Please can I come and stay?! all your food looks so good; a perfect bowl of porridge especially and the deconstructed burgers sound fab! I’m Always hungry for cottage cheese! YUMMY looking WIAW post Fran. PS: WordPress was making me crazy yesterday too! Yum, a chocolate chip cookie is the best snack ever! Hi Katie! Crumbs are not to be left behind and if you’re already counting the cookie (maybe) then how could the crumbs count! Thanks for visiting…stop by again! I am a big fan of the ginormous chocolate chip cookie. I had the feeling that would get a lot of people, Zo! Just wish it had tasted better. Ok, Sara…I’m ready to share! I love salads. There are so many things you can do with them, and I’ve actually learned some different things since starting BCDC. Trying to creative makes me come up with things. It fills me up and it’s good for me! What more could I ask for?! Thanks for visiting, please stop by again. Dohhh I am sorry you are having some blog issues! Whenever that happens to me, I flip out because I never know how to fix technical issues! The cookie is just perfect, is there anything better than a classic cookie for a treat? Nay! Tessa, this technical stuff makes me crazy!! Still can’t figure it out. I need an expert…gotta find one! Glad you like the cookie! Sorry about your WP issues, I wish I could help, but I’m on Blogger….and that’s not without it’s own issues too! Regardless, your eats still look good and I’m really craving an egg white omelette with cottage cheese now! I always get a kick out of your blog name, makes me smile for the day, thanks for that. What if you broke the cookie dough before baking and had a full batch of nothing but broken cookies? That’s a lot of good “not counting” to have!! Happy WIAW, hope you are able to solve your blog’s issues soon. Thanks, RC!! This particular diner has so me great unusual choices. I love cottage cheese as a substitute for home fries. I usually do that or sliced tomatoes. So good! Hoping to get the WP problems solved! !